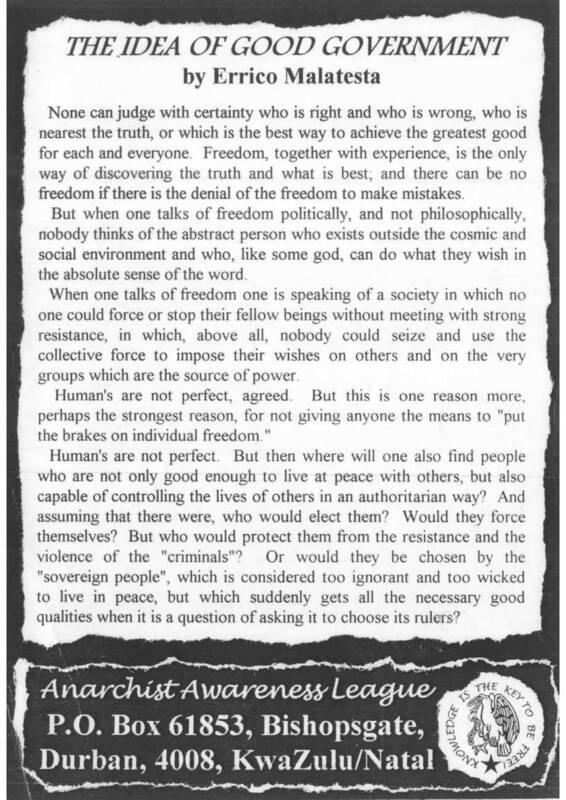 This text was published by the Workers Solidarity Federation (WSF) in South Africa in 1997, and is a shorter version of What is Anarchism? A South African Anarchist Pamphlet: author of both was Lucien van der Walt: details here. The emphasis was on South African issues, and accessible writing. It was republished in 2003 in its current format by WSF successor groups, the Bikisha Media Collective (BMC) and Zabalaza Books. It is not clear what changes, if any, were made in 2003. Get the PDF here. This text was found at the Zabalaza Books website, which has materials going back to the 1990s, and is located here. Note that is a PDF, and laid out in a format designed to be printed out as a folded, stapled A5 pamphlet. Get the text here. This is apparently the same text as the PDF (not checked). There was also an Afrikaans translation of the pamphlet, for distribution in the Western Cape. It differs slightly from the English version, and presents itself as an introduction to the WSF in the title and in the opening. Its in a PDF here and in text here. This text was published by the Workers Solidarity Federation (WSF) in South Africa in the late 1990s The first edition appeared in 1996. The 1997 version (2nd edition) was then reissued by the WSF successor organisations, the Bikisha Media Collective (BMC) and Zabalaza Books in 2003 in the current format. It is not clear what changes, if any, were made in 2003. The cover is an image of two comrades at the 2001 WCAR protests in Durban. There was a 1997 spin-off called Only the Workers can Free the Workers, a 1998 one, Breaking the Chains: A History Of Libertarian Socialism in 1998, and then a 1999 (3rd) edition, What is Anarcho-syndicalism? (see below). The 1997 text placed a heavy emphasis on South African issues, and included extensive South African perspectives on student movements, the unemployed, imperialism, race in South Africa, the issue of trade union reform, and so on. It also included some material on “anarchism in action”in Russia and Spain. The 1997/ 2003 text is currently still in print by Zabalaza Books, as well as by Black Cat Press in North America: see here. The text drew some sections drew directly on a 1980s pamphlet by the Workers Solidarity Movement (WSM) in Ireland, to which WSF was closely linked. But it added extensive South African material, and also expanded the “anarchism in action” part. Meanwhile, a shorter variant was published in 1997 (also reissued by BMC and Zabalaza Books in 2003), as Only the Workers can Free the Workers, which is available here. An expanded 3rd edition was written by Lucien van der Walt, now called What is Anarcho-syndicalism?, for the February 1999 WSF conference. This was notable for providing a greatly expanded and global history: the discussions of Spain and Russia were now just part of a larger story starting with the movement’s orgins in the First International, with material on the 1880s, the rise of syndicalism globally from 1890s, discussions of the 1920s and 1930s, and the movement after 1945, as well as thematic discussions of the history of anarchism and syndicalism in fights against imperialism, women’s oppression and racism. A longer version of the history, by the same author. was issued by the “WSF National Secretariat” as Breaking the Chains: A History Of Libertarian Socialism in 1998, later expanded into books etc. Get the PDF of the 1997 text here. Note that the text was found at the Zabalaza Books website, which has materials going back to the 1990s, and is located here. Note that is a PDF, and laid out in a format designed to be printed out as a folded, stapled A5 pamphlet. Get the 1998 Breaking the Chains: A History Of Libertarian Socialism here. Get the 1999 text What is Anarcho-syndicalism? here. This is the Word version recovered from older discs and may not be the 100% final version. More on International Libertarian Solidarity Network here and here. Several South African anarchist projects — Bikisha Media Collective (BMC), Zabalaza Books (ZB) and the Zabalaza Action Group (ZAG, formerly the Anarchist Union) — have signed up as members of the new anarchist network International Libertarian Solidarity (ILS) of which the following organisations are also a part: Al Abdil al Taharouri (AAT, Lebanon), Alternative Libertaire (AL, France & Belgium), Confederacion General del Trabajo (CGT, Spain), Organisasion Communiste Libertaire (OCL, France), RÈseau No Pasaran (France), Consejo IndÌgena Popular de Oaxaca — “Ricardo Flores Magon” (CIP-RFM, Mexico), Confederation Nationale du Travail — “Vignoles” (CNT-V, France), Federacio Anarquista Ga?cha (FAG, Brazil), Federacion Anarquista Uruguaya (FAU, Uruguay), Marmitag (Greece), Organizace RevolucnÌch Anarchistu-Solidarita (ORA-S, Czech Republic), Organizacion Socialista Libertaria (OSL, Argentina), Organisation Socialiste Libertaire (OSL, Switzerland), Sveriges Arbetares Centralorganisation (SAC, Sweden), and the Workers’ Solidarity Movement (WSM, Ireland). Other groups that support the ISL are the Industrial Workers of the World (IWW, international), Anacho-Sindico (India), the North-Eastern Federation of Anarcho-Communists (NEFAC, Canada & the USA), Sibirskaya Konfederatsia Truda (SKT, Russia) and Unione Sindacale Italiana — “Roma” (USI-R, Italy).This makes the ISL one of the most important players on the international anarchist stage today, alongside the International Workers Association (IWA) — established in Berlin in 1922 as the anarchist unionist alternative to the communist Red International of Trade Unions — and the International of Anarchist Federations (IFA), founded in Italy in 1968, to unite anarchist political organisations. But the ISL is not another international. It is rather an international anarchist network, other anarchist international networks include the Anarchist Black Cross Federation, started in London in 1967 to assist anarchist and class war prisoners, and the Insurrectional Anarchist International (IAI), founded in Italy in 2000, to co-ordinate anarchist resistance in the Mediteranean [sic..
Our participation in the ISL dates back to the BMC delegation sent to Paris for the “Other Future” international anarchist congress organised in 2000 by the CNT-V which saw 6,000 anarchists take to the streets with a forest of red-and-black flags for May Day. There, delegates of 15 participating organisations agreed to form a new network to: a) connect the growing anarchist unions, anarcho-communist, platformist and anarcho-synthesist groups that fell outside the IWA; b) co-ordinate international anarchist engagement with the emerging anti-capitalist movement; and c) for established Northern organisations to assist emergent anarchist organisations in the global South. Last year, at “LibWeek” in Madrid, the decision was realised when the international movement set up the ISL, which has expanded significantly since then. Bikisha Media and Zabalaza Books sent a message of support to Madrid to endorse the establishment of the network of which we are now a part. The ISL is by no means a paper tiger: so far, the network has helped the FAG-Brazil with finances in setting up a printing works and a community centre. There are also ISL-sponsored projects under way in Uruguay and another planned in Siberia. We should take this opportunity to thank ISL member organisation the SAC-Sweden for their kind donation of funds — under an agreement separate to the ISL — to our anarchist printing project. We as South African anarchists are encouraged by this important initiative — the establishment of an international co-ordinating network to aid anarchist organisations in their engagement with the anti-globalisation movement. Such a network is vital if we are to survive the attacks on our organisations and our class — and if we are to succeed in our fight against neo-liberalism. We would also like to add the names of our two organisations to those endorsing the “Anarchist Declaration for the 21st Century”. Since the 1970s, our enemies, capital and its siamese twin, the state, have been suffering from one of their inevitable periods of crisis as markets hit natural consumption ceilings and the rate of profit continues to fall. Even the opening of the former Soviet and East Bloc workforce to foreign exploitation, with robber barons breaking down vital industries to steal handfuls of cash, has been unable to stop the slide. But like hungry bears, our enemies are even more dangerous despite their weaknesses. On the one hand, their claws are sharper: they have developed warfare, terrorism and propaganda to technological and psychological levels never achieved before. On the other hand, we, their prey, are weak: the international working class revolutionary movement, both anarchist and otherwise, has been dispersed and destroyed by decades of fascism. After the Berlin Wall fell, our enemies announced the end of history, claiming that they had achieved the perfect social balance, a balance built historically on millions of dead, and today maintained by millions of lives cheapened by poor working conditions, corrupted by a fouled environment, marginalised by casualisation, raped by patriarchy, excluded by so-called democracy and, if necessary, eliminated by death-squads. But the bears miscalculated. History is not over. The anti-globalisation movement is the most significant international social movement since the 1960s. There are dangers: professional networks of paid middle-class activists have attempted to turn it into their own club, a collection of narrow sectarian interests. Also, totalitarian and right-wing organisations, whether fascist, religious fundamentalist or authoritarian socialist, are trying to control grassroots actions against the IMF/World Bank, the “free” trade agreements and the multinational corporations. But this is a global movement of the oppressed. Its instinctive nature is anti-authoritarian, workerist and militant. This is the true home of all anarchist revolutionaries today and we fully support all efforts by anarchists to position themselves at the forefront of the struggle and to put their ideas at the centre of the global debates on how to beat the ravages of turbo capitalism. The anti-globalisation movement must be dominated by anarchist forces and arguments. We as anarchist revolutionaries must throw ourselves wholeheartedly into this struggle. But we must remember our key strategic strength: the united forces of the proletariat, whether industrial or commercial. This means that while community struggles are essential, they can be no substitute for revolutionary organisation in the workplace, at the point of extraction of profit. The traditional working class may have changed, but workers’ status as wage-slaves has not, regardless of how the capitalists have tried to divide their common interests. And it is only the workers who have the technical power and class incentive to stop the engines of capitalism. Only a revolution in the relations of production by organised labour and a seizure of the means of production by the producers can end the terrorism of capital and the state. Assisted by the peasantry and the poor, the workers can and will defeat neo-liberalism, however it disguises itself: racism, housing evictions, neo-colonialism, electricity cut-offs, sweatshops, criminalisation of protest, or other masks. FOR WORKERS’ SELF-MANAGEMENT, DIRECT ACTION AND INTERNATIONAL REVOLUTION! 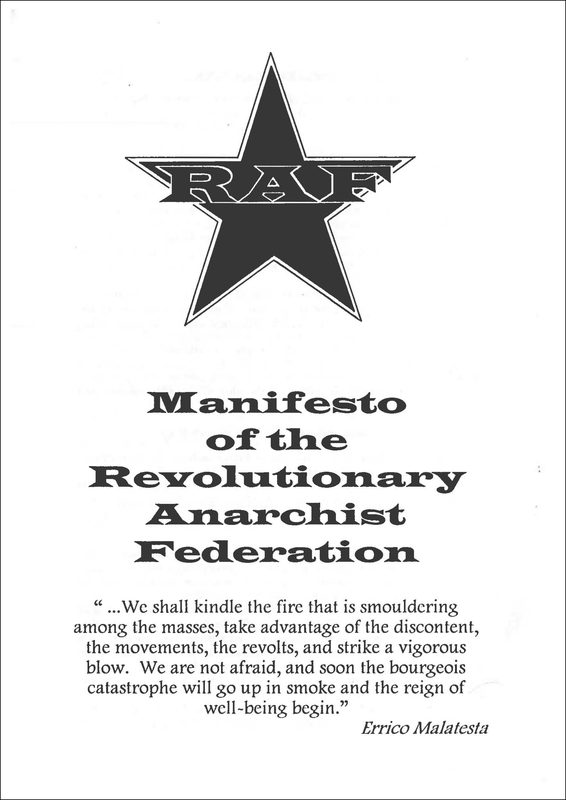 This was one of many texts produced by the Durban-based Anarchist Awareness League, but its not clear whether it was produced in the group’s initial incarnation (from 1993) or revival (from 1997). The group later became Zabalaza Books. More on its history is here. The Anarchist Awareness League was formed in Durban in 1993. It was mainly involved in publishing leaflets, pamphlets and posters. At some point it became part of a new Durban Anarchist Federation, along with a “green” and feminist collective. In 1997 the Anarchist Awareness League was re-established. Renamed the Anarchist Workers Collective (AWC), it joined the Workers Solidarity Federation (WSF) that year. there had been a Durban WSF section founded in 1996, but it was short-lived (and by this time) defunct. The Anarchist Awareness League / AWC was renamed “Land and Liberty” in 1998, and then Zabalaza Books in 1999 after WSF closed. When the Zabalaza Anarchist Communist Federation (later Front) was formed in 2003, Zabalaza Books was a founding collective.